The concept of Pads Pro is really simple. 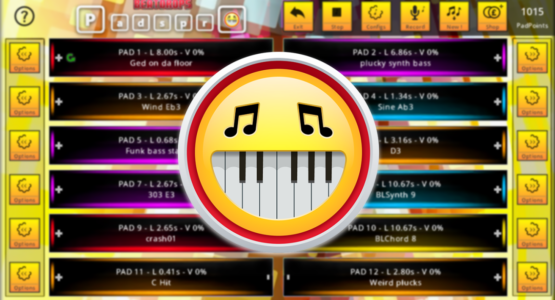 It gives you 12 big sounds pads which you tap to play or loop its sound. We made it fun by letting you easily download 12 new awesome loops or sample from our huge BeatDrops sound library randomly! Bored? Press ‘New !’ again to get a new set of 12 random samples! Shop – Run out of PadPoints? Click here to buy more! You can change the colours and theme of the app user interface by tapping button labelled ‘Solid’ to toggle solid/transparent Pads. Select ‘Maintain Sample Styles’ if you want to make sure that each Pad keeps the Style (like Drums or Chords) when you download new random samples. If you only want loops use the appropriate selector to toggle loops only on / off. You can also make sure all new random samples are of a certain Style.. e.g you may only want 12 new random Vocal samples. Pressing record starts recording audio playing in realtime using your default microphone input. Once saved you can find the recording in the folder shown. Dont forget to top up your PadPoints when you are running low so you can carry on having fun with the app! You can change one sample at a time, this saves PadPoints and is quicker. If you want to keep the style of sample such as Drums then select ‘Same Style’. If you only want Chords then tap the button labelled ‘All Styles’ until the desired Style is shown. Also you can select the box to only download Loops. If you want to make sure this Pad sample is never changed (except when you load preset samples) then tap the ‘Locked’ selector. For each sample you can select to Loop it continuosly and you can also ‘Sync Start’ it. When you have Synced Start when you press one Pad that is synced ALL other Pads that have Sync enabled will also start playing at the sample time. This is a great way to create a drum/bass line combo and then you can start and stop them easily. Press Refresh to Re-download the sample in case it becomes damaged or is deleted somehow. Note this is free and not use up any PadPoints. Before you press change to download a new sample for that one Pad, you can see the Total cost (PadPoints) at the top. Tap any Pad to play its sound. Press near the Minus for low volume of the Plus for louder volume. You can hold down a Pad and slide your finger left or right to change the volume! 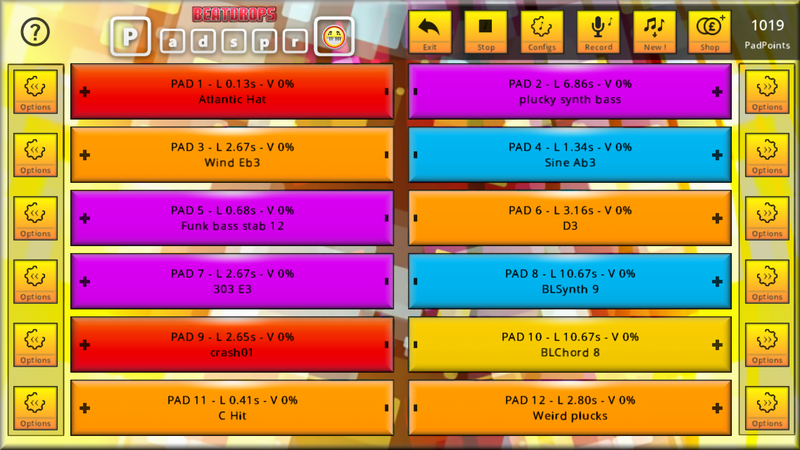 Pads Pro has multi touch support! You can play or control upto 5 Pads at the same time! If a sample is Looped you will see a rotating green arrow on the Pad. To stop a Looping Pad just tap it again.